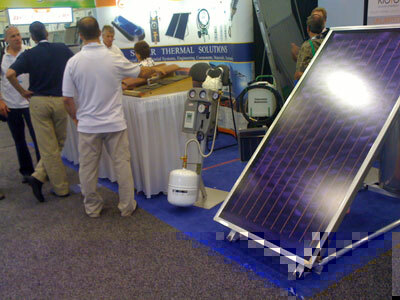 San Jose, CA July 13, 2010 — Free Hot Water, a manufacturer and distributor of solar thermal collectors and solar water heating accessories, is celebrating is its recent 2010 achievements at Intersolar North America in San Francisco. Through just the first half of 2010, Free Hot Water has built exclusive supply chains, gained SRCC certification, growing its dealer network, and joined a national coalition of solar companies offering free solar systems to the White House. February 6, 2010, Münster, Germany-based Weicon, Inc selects Free Hot Water as the exclusive U.S. representative for its lubricants, adhesives, sealants, and technical aerosols products, which are designed specifically for solar applications. April 13, 2010, Free Hot Water received the Solar Rating and Certification Corporation (SRCC) OG-100 Certification for its 7000 Series solar collectors. In addition, more SRCC approvals are expected in 2010 for the latest Free Hot Water solar collectors. April 22, 2010, As an Earth Day gift, Free Hot Water, Sungevity, and Kaco New Energy led a coalition of solar companies who have offered free solar systems to the White House. Since the initial announcement, SEIA, ASES, and other solar advocacy organizations have also joined their cause. May 24, 2010, Free Hot Water announced that it had signed an exclusive U.S. distribution agreement with Baymak, a worldwide manufacturer of solar thermal storage tanks. The exclusive agreement means substantial savings for Free Hot Water’s installers and distributors. June 2, 2010, Free Hot Water signed a distribution agreement with SunReports, Inc., a provider of unique solar hot water monitoring solution that measures and verifies the performance of commercial and residential solar hot water systems. In addition to the above milestones, Free Hot Water has now built a network of nine sales and distribution offices across the U.S., Puerto Rico, The Virgin Islands, and the Caribbean nations. Free Hot Water is inviting the entire solar community to visit their booth at Intersolar 2010, located at the Moscone Convention Center, Level 1, Booth 7519, July 13th-15th. Founders Paul Burrowes and Gal Moyal will be there to discuss how Free Hot Water can help solar thermal and PV installers meet their own goals for 2010.